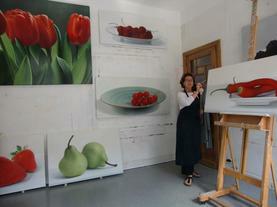 ​RIA DE HENAU was born in 1954, grew up in Geraardsbergen and now lives in Ghent (Belgium). It became clear at a very early age that Ria De Henau could express her intense ‘state of being’ through her artistic talents. For her, music and painting became intimately associated. Even now, as an adult artist, she refers to the ‘frequency of vibration’ of colours, and these colours also evoke sounds.